This simple, comforting, and delicious soup was something extremely satisfying for the cold winter weather...not to mention healthy and full of fiber and protein (low fat too!). 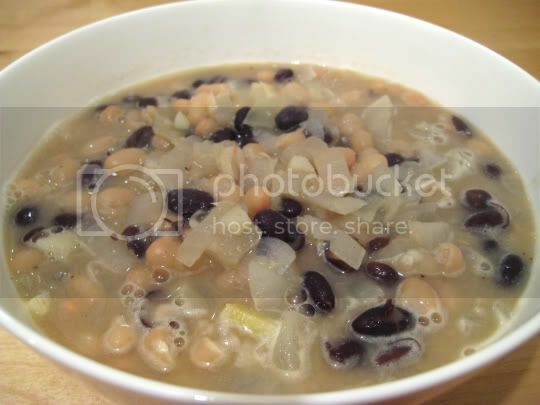 Although the list of ingredients is rather short, you would never guess that only an onion, lots of garlic, three kinds of beans, and vegetable broth make up this complete meal. And when I say lots of garlic (6 cloves), you can DEFINITELY taste it. This is more of a...garlic bean soup. The flavor of the soup is very mild, but the extremity of the garlic really adds some punch. And when I say simple...saute onions; add beans, garlic, and broth; puree one of the cans of beans and add to the soup; and you're done. I did add about 1/4 teaspoon of salt and pepper each to give it a little more flavor, but that was really all it needed. The soup wasn't as thick as I imagined it would be, but it was still wonderful. Make again? Definitely. This is what I call a budget recipe, and leftovers were great!